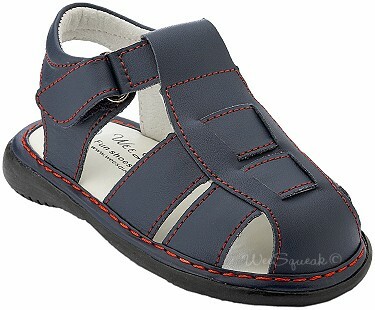 Navy fisherman style sandals for little boys have a great look to enhance your child's outfit. Fisherman Wee Squeak boys sandals squeak when children walk. Upper part is leather with very wide toe box and extra support for little feet. Sole is rubber, very flexible for additional comfort. Perfect for first time walkers, toddlers and bigger boys. Available in sizes from 3 to 10. These boys sandals are one of parents and kids favorite, providing all in one fun for kids, comfort and quality! !